Discovery Channel’s newest motorcycle-themed mini-series, Harley and the Davidsons, airs this Monday, September 5th, at 9pm. 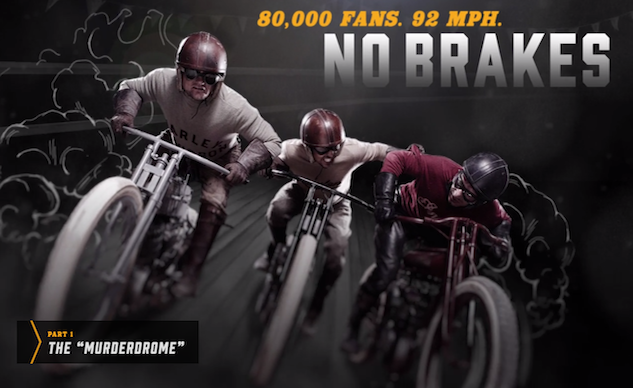 Previews of the show depict what looks to be an entertaining, and somewhat historically accurate presentation of Harley’s early days, and the dangerous sport of motordrome racing. Discovery’s website dedicated to the mini-series offers a wealth of videos, historical photos, information, and this super-cool 360 VR video. From Discovery: A Harley-Davidson is more than a motorcycle. It is a symbol of Americana, built from the ground up by founders Walter and Arthur Davidson and their friend Bill Harley. But the road to success was not exactly smooth – it was filled with innumerable obstacles, ruthless competitors, and extraordinary risks. Together these three young men, the sons of blue-collar immigrants, gave everything they had to ensure the survival of the company they founded. But just how far would they go to reach the ultimate American dream?